Any museum goer should start here, in one of the city’s most ambitious construction projects: the Museumsquartier. It contains some of the city’s most important art museums, including the Leopold Museum, the Museum of Modern Art and Kunsthalle Wien. A museum unlike any other, the Haus der Musik is an interactive sound museum which focuses on many different aspects of music, from history to science. Each floor holds a different theme, the first being an exploration of the Vienna Philharmonic, the second is all about the science of sound, the third has several rooms dedicated to great composers and the forth contains a virtual stage in which you can create your very own opera experience. You can’t really get more Austrian than this: at the heart of the Hofburg Palace, the Sisi museum offers a glimpse into the life of Austria’s favourite member of royalty, the Empress Elisabeth, better known as Sisi. The museum holds more than 300 of the empress’s personal belongings, from her baptismal dress to the death mask made after her assassination. This striking baroque building holds some of the most beautiful frescoes in all of Austria. Not only does the library contain numerous life-size statues and pristine baroque decoration, it boasts a collection of over seven-and-a-half million items, including manuscripts, musical scores and a photographic archive. Another collection of noteworthy museums, this time all dealing with the city’s rich history. 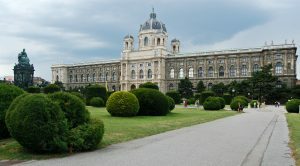 Its’ collections are held in Vienna Museum Karlplatz, Vienna Museum Hermesvilla and the Otto Wagner Pavilion. Opposite the Kunsthistorisches Museum, this museum contains 39 galleries of natural history, including vast collections of minerals as well as precious stones belonging to the Empress Maria Theresa. You can even find relics and artefacts dating back to the Stone Age, which have been on display here since its founding in 1765. This museum is situated in Sigmund Freud’s old house, in which the famed psychoanalyst lived for almost 50 years. The open rooms are set up exactly as they would have been when Freud lived there, which include his waiting room, treatment room and study.